Originally an exposed, unadorned space overlooking the city, the twelfth-floor terrace of this New York penthouse capitalizes on a system of ‘controlled views.’ The terrace offers a panorama of the Manhattan skyline and Central Park, yet retains a sense of intimacy and privacy through creative screening. An arbor with lattice sides screens nearby buildings and overhead views. The arbor subdivides the long and narrow terrace, converting it from a corridor into a series of garden rooms. A system of low-voltage lighting, concealed in the overhead beams, downlights the red quarry tile floor. 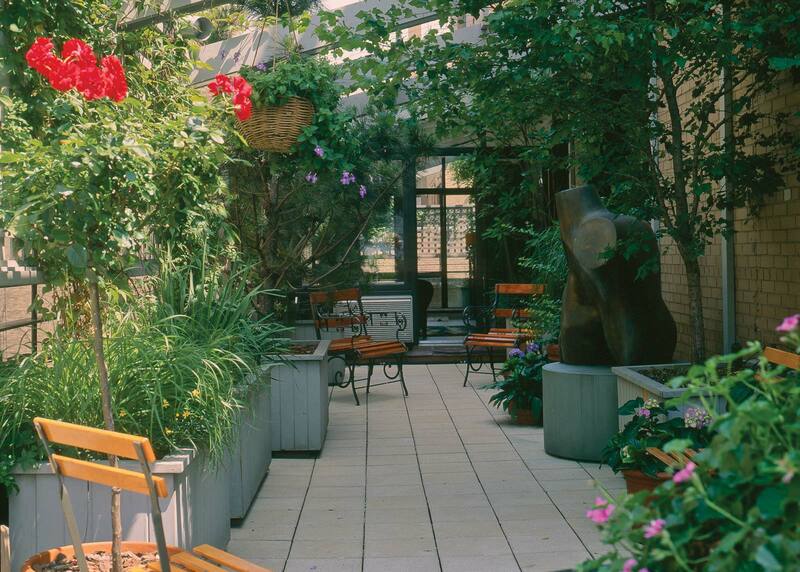 Throughout the terrace, layered perennials and potted trees create depth, while large-scale sculptures by Henry Moore and David Jacobs provide a dramatic contrast to the verdant planting. 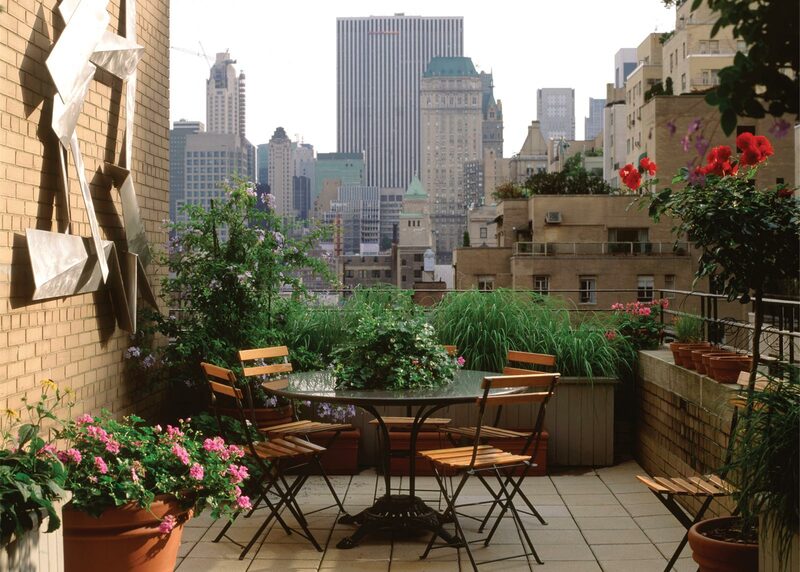 The design navigated myriad municipal laws regarding rooftop planting. Plant containers are set back from the building’s parapet, elevated off the floor, and are movable. The containers adhere to weight and size restrictions. 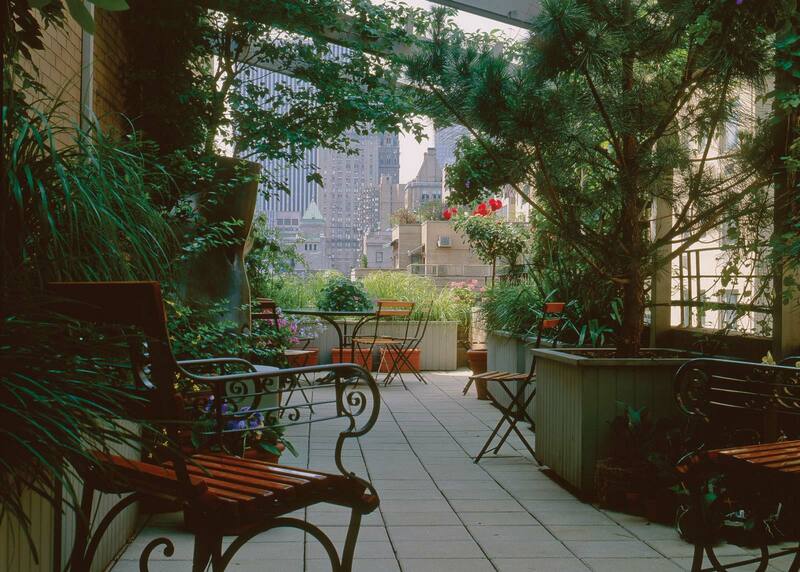 This urban hideaway, screened for privacy and focuses on the ‘cityscape,’ maximizing outdoor space above Midtown and Central Park.